The latest app from Information Architects, iA Writer for Mac, has been highly anticipated since iA launched their incredibly popular iA Writer app on the iPad. Writer is in every way, shape and form, an exercise in minimalism and focus. I have long been a fan of their iPad version and was really excited to see what they could do with the Mac version. This app is so very basic and simple, yet so very interesting that I find myself both struggling to describe what makes the app good and having to hold back praise of the app at the same time. To give you a very short synopsis, iA Writer may once again make me rethink the way I write and that’s a good thing. Currently I write everything in TextMate on my Mac, this was a conscious decision I made to standardize my writing environment. When I open TextMate I know it is time to write. Since OmniOutliner came out I began outlining posts on my iPad, tossing that outline into TextMate and writing and editing in TextMate. I did this all with the occasional post written in Notesy or iA Writer on my iPad when my Mac wasn’t convenient to use. That’s what I did before iA Writer came out and before we get into what I am doing now (and what I think I will continue doing) let’s take a look at iA Writer for the Mac. I am constantly testing different text editors on all sorts of platforms and because of this I have a standard way of testing these apps. Typically I open up a new document and just start writing stream of conscious thoughts about the app, once I am done those thoughts sometimes become reworked and interweaved into whatever I may write about the app. More often it is another text file that lies in a wasteland of old text snippets in Dropbox. This is a test to see how much, or how little I hate iA Writer for the Mac. It is a $17.99 Mac app, available in the Mac App Store — setting the bar high for the “focused-writing-app” category. This falls in the category of apps that is made by people who actually use the product — in this case — writers. When I immediately have a connection with an app I know there is far more than meets the eye — this is very much the case with Writer. Of course many of you will note that apps like Ommwriter, WriteRoom (long time favorite of mine), Byword and many more have offered the “focused-by-way-of-fullscreen-mode” long before Writer came out. 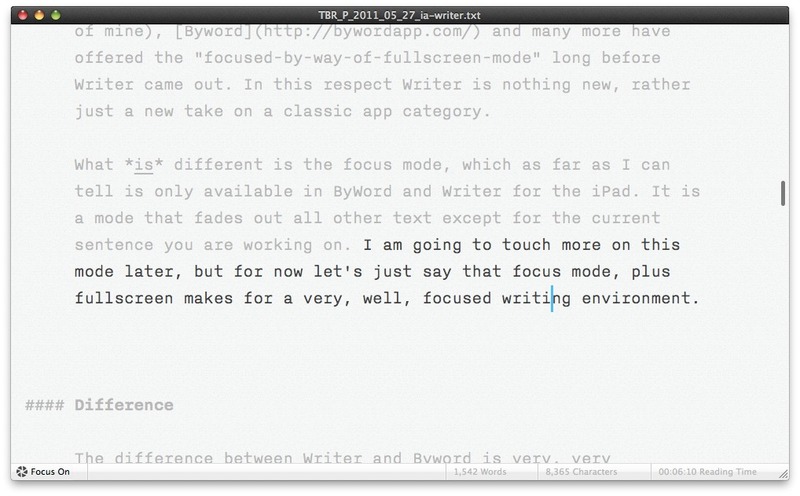 In this respect Writer is nothing new, rather just a new take on a classic app category. What is different is the focus mode, which as far as I can tell is only available in ByWord and Writer for the iPad. It is a mode that fades out all other text except for the current sentence you are working on. I am going to touch more on this mode later, but for now let’s just say that focus mode, plus fullscreen makes for a very, well, focused writing environment. The difference between Writer and Byword is very, very significant. Writer has zero preferences and while Byword has limited preferences it has far too many options. Allowing you to pick what you see in “focus mode” is nice on a bullet point feature list, but in practice it is far too much choice. On and Off is all you really need. Not to mention Byword doesn’t “lock” into focus mode nearly as well as Writer. There is not a single thing you can change about Writer. Want it to be a different color? Too bad. What a different font? Fat chance. The difference is full featured versus focus. It’s something that Hog Bay got right the first time with Writeroom — don’t bother with features, make the main feature the lack of features. Writer takes that thought process to the next plateau and does a really good job of doing so. I paid $17.99 for an app that has no preferences, forces one font and one color on me and doesn’t even show me spelling errors while I type! Yet, I am perfectly happy with my purchase. 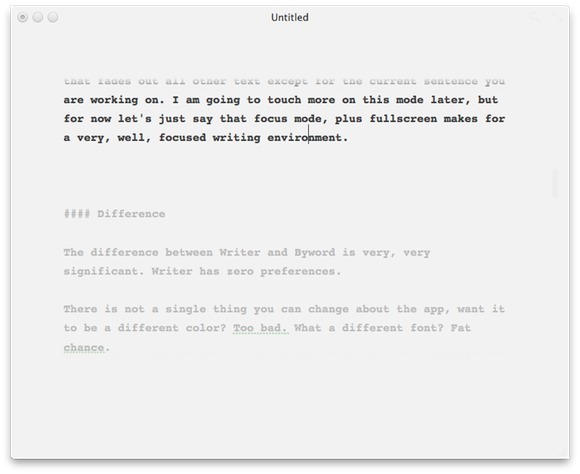 Byword is for people that know they want to do all their writing in one app. Writer is for people that just want to open something and write. CMD+D versus CMD+1, or CMD+OPT+1, or CMD+2, or… you get the point. I often joke about how much time I waste in Keyboard Maestro crafting funky things, or how much time I spend in OmniFocus tweaking the look and layout of the app. The problem is that the more powerful something is — the more features you give the user — the more dangerous it is to tinkerers, and I am very much a tinkerer. Writer keeps me from doing any of those non-writing activities. There is an amazing amount of attention that has been paid to the entire app — from the background and its subtle horizontal lines and slight grey-white appearance. To the not quite black appearance of the text, to the overly large and cyan-ish colored cursor. There is not a single facet of this application that was not thought about in great detail. And as a user you not only see that, but you feel it. I say that the design is a prominent feature of the app because it is so damned effective on keeping me writing. How often have you been working on a document, stepped away or switched out of the app, only to come back and not be sure where you were? Well the grayed out text will get you right back on track and the big blue cursor will make itself readily apparent — why don’t all apps do it like this? That’s Jonathan Ive speaking about how he designs in the film Objectified, but I think it perfectly encompasses what iA has done with Writer for the Mac. Writer supports Markdown recognition and does so with title tags by pushing the formatting into the left margin. The side effect of this method is that you can quickly move through the document and see where your sections start — that’s much easier than a hard margin. The rest of the Markdown support has been implemented very subtly allowing you the writer, to once again focus on your craft. I teased above that I think Writer will change how I write for the better. The biggest problem that I face when I write is poor editing and structure. I solved a lot of structure problems by going back to outlining posts, editing though continues to be my problem. I tend to gloss over goofy mistakes because I edit for flow and red squiggly lines. This means I read my posts very quickly and miss a lot of small things — much to the annoyance of all of you. Writer’s focus mode forces me to read sentence by sentence, meaning that I am far more likely to actually read the sentence instead of just flying by it. 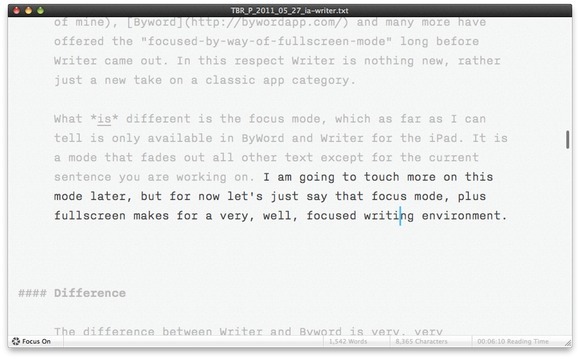 Edit for non-spelling mistakes in Writer’s focus mode. Make use of estimated reading time too (this is a far better metric than word counts and gives me a good idea of how many people will actually read a post). Paste into TextMate for spelling, final editing, image insertion, link adding, and posting to blog. The neat thing is that all the formats are compatible and easy to use with one another. At first this seemed like overkill and using too many apps to me when I got by with just two before. However I have been sitting in this Starbucks now for 2 hours doing nothing but writing in Writer and have yet to get the normal urges I had to ‘go do something else’ — that’s what matters to me, not how many apps it takes me to get there, but the end result. To navigate between sentences in the app you use the command key plus the left or right arrow keys. This is very nice and easy to do, but it means that you can no longer use CMD+Right Arrow to move to the end of the line. This is not completely a deal breaker, but it does trip me up at times. When focus mode is on and you are in fullscreen mode I tend to page through sentences and the text does not scroll fast enough. I would very much like Writer to always keep a few lines of text below the current “focused” sentence so that the text doesn’t get paged off the screen. This actually is the biggest annoyance I have right now. Go check out Writer on the fantastic site for it. Forget about the price and instead ask yourself if you think it would make you want to write more — if so, that alone is worth far more than $20.